For thermal springs, many go to countries like Italy, Czech Republic, France and Bulgaria. But such Exotica you can see and Tyumen region. There are 4 thermal springs - "Upper Bor — Eldorado", "Sosnovyy Bor", "Kentron" and "Wild". The base of rest "Eldorado" is located 11 km from the regional center of Tyumen and 340 km from Yekaterinburg. Located on the shores of Crooked lake near the pine forest. In order to get to the source, please go to the Salair tract. From Tyumen on weekends and holidays to the base can be reached by free Shuttle bus. Transport departs from a stop "Regional library" in 12:00, 13:00, 15:00, 16:30 and 18:00. The flight might be cancelled in case of rainy weather and the air temperature is below 20oC. Sosnovyy Bor is located 27 km Yalutorovsk tract on track in Omsk. Nearby is the village of Vinzili. From the bus station of the village to mineral spring and a free Shuttle bus. To Vinzili every half hour and go straight passing a bus from Tyumen station. In addition to two outdoor hot spring pools, there are children's rides and a zoo. 30 km from the city of Tyumen, near the village of Kamenka is a hot spring "Avan". To get to recreation center by car on Irbitskogo tract. Also taxis run regularly and buses. On the bus to drive to the village of Kamenka. Direct flights to the village there, but every hour walk passing routes. The ticket price is R. 60, travel time — 1 hour 10 min. 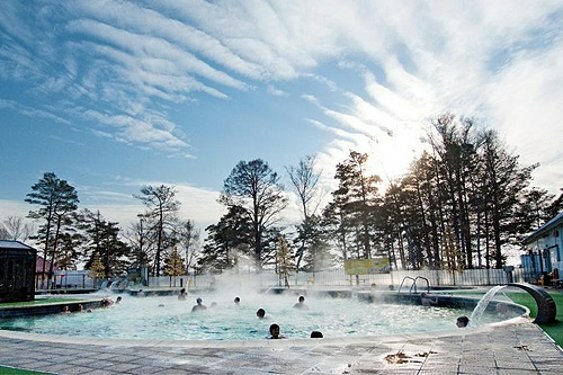 A few kilometers away from the recreation "Eldorado" is a hot spring "Wild". The name of the hot spring, speaks for itself — there are no hotels, landscaped areas, cafes, etc. But running the kind of source no one is afraid and the pool is always filled with people. Can be reached by car in Salair tract. To the Tyumen can be reached by bus, plane or train. International airport "Roshchino" it takes an aircraft with such cities as New Urengoy, Salekhard, Beloyarskiy, Sochi, Moscow, Krasnodar, Novosibirsk, Saint Petersburg, Sochi, etc. At the train station the trains arrive with dozens of cities of Russia and neighboring countries. The timetables with the direction to Tyumen you can find a single reference RZD 8 (800) 775 00 00. From the cities of Almetyevsk, Surgut, Kurgan, Yekaterinburg, Kokshetau and Tobolsk, Nizhnevartovsk, Perm, and Orenburg, and go big comfortable buses. And already in the Tyumen should buy tickets to the sources. At the information Desk of the bus station you can clarify about the free routes to the destination or to buy a ticket on the bus.